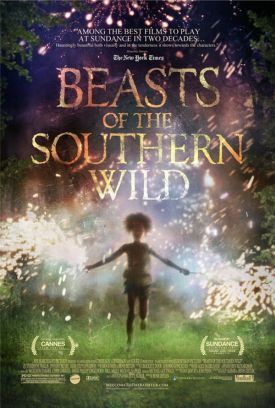 If you liked Terrence Malick’s Tree of Life — or, for that matter, any of his films since Badlands (1973) — you will probably also like Beasts of the Southern Wild by Benh Zeitlin. I didn’t and don’t, but that doesn’t mean I think Beasts is as bad as Mr Malick’s absurdly pretentious productions — which I have written about here, here and, most recently, here. In fact, I liked some of the more spirited parts of Mr Zeitlin’s movie, or at least more parts of it than I can find to like in Mr Malick’s. What it has in common with them, however, is pretentiousness — though it is not so much of the absurd kind. Mr Zeitlin’s pretentiousness rather takes the form of intermittent bolts of politically correct propaganda about global warming (and other things) together with a Rousseau-esque faith in the natural goodness of man — or, in this case, of little girl — in the state of Nature. The little girl in question is Hushpuppy (Quvenzhané Wallis), who lives with her daddy, named Wink (Dwight Henry), on a low-lying island called the Bathtub off the Louisiana coast near New Orleans. As the Bathtub sits outside the levees to which the city owes most of the dry ground on which it is built, we know it will not take a Katrina-style breaching of these defenses to swamp Hushpuppy and Wink and their joyously uncivilized community, but almost any sort of storm — which no doubt accounts for the strictly improvisatory sort of housing and economic life they and the other residents of the Bathtub are used to. Sure enough, a storm comes along and swamps them, though their spirits remain undampened. What’s worse from their point of view is that they are forced to go, though briefly, "up in the dry world" where they regard the people as being of effete stock. "Daddy says that on the other side of the levee they’s scared of the water like a bunch of babies," as Hushpuppy tells us in one of her endearing voiceovers. To these, which may begin to get a little annoying after a while unless you are more smitten with Hushpuppy’s feisty cuteness than I am, we also owe a certain mordant commentary on the more familiar forms of American life. "Ain’t that ugly over there?" she asks us as we view the smokestacks of a power plant up in the dry world. By contrast, the lushly overgrown Bathtub, teeming with wildlife of all sorts, is said to be "the prettiest place on earth." Hushpuppy’s foray into the dry world coincides with her father’s serious illness, which is described to us as his "blood eating itself," for which he has to be taken to a hospital. But her adventures there are, like much of the rest of the film, hallucinatory in part, presumably because they are meant to be seen through the eyes of the child. The storm is quite a minor part of the movie and less scary to Hushpuppy — who must be used to such catastrophes — than either the illness, which threatens to deprive her of her one remaining parent, or the aurochs, a very large bovine creature that her teacher tells her about at the same time she tells her about global warming. "Everything south of the levee is going under, so you had better learn how to survive," says the teacher. To the child, the foretold calamity is associated in her mind with the aurochs, signifying disaster, even though the aurochs have been extinct for centuries and were never native to the Americas when they did exist. She imagines them as "animals that eat their own mamas and daddies." They and their apocalyptic significance are also associated in her mind with the dead animals after the storm. "For the animals that didn’t have a daddy to put them on the boat, the end of the world already happened. They’re down below trying to breathe through water." Hushpuppy has bad dreams about these animals, or a version of them as created out of her imagination, to which the film devotes rather more time than they deserve. They (or their images) are part, however, of the "beast" theme, along with her father’s instructions as to how to eat a crab. Not, that is, in the "dry world" way with utensils but by breaking it open with her hands and sucking the meat out. This is what he means when he tells her to "Beast it." His glorying in being uncouth by middle-class standards and as unlike the "bunch of pussies" on the mainland as possible — "wild," in short — has a natural appeal to the child, which seems to me to be at odds with the stirrings of civilized life and thought in her, to which Mr Zeitlin is leading us. These are evident when she observes that "the whole universe depends on everything fitting together just right" or claims to be preparing an artistic record of her existence so that "scientists of the future will report that there was once a Hushpuppy who lived in Bathtub with her daddy." Not if they live in the kind of primitive society this film celebrates they won’t.